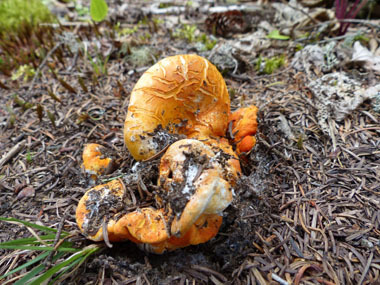 Overview: The overall look is that of a capped mushroom (which contorts with age) covered with a finely bumpy, vivid orange to orange-red layer. The gills of the host mushroom can be entirely obscured by this parasite. 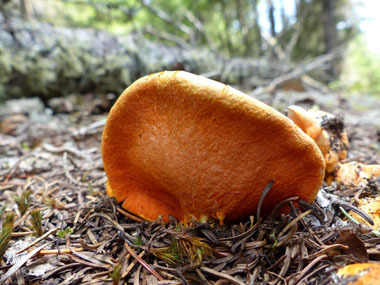 It will still produce spores, but only those of Hypomyces Lactifluorum. These emanate from countless reddish-orange perithecial mounds (pimples) which dot the surface at maturity. 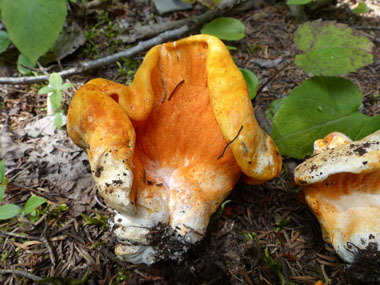 Distinguishing Features: Lobster mushroom ‘fungus’ creates the bright orange covering over a Russula or Lactarius mushroom. The surface is rather hard, and dotted with tiny pimples. 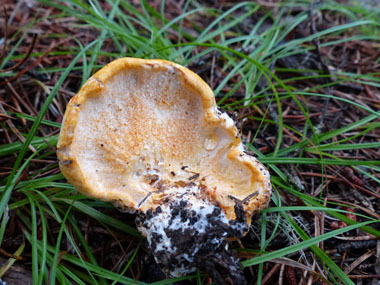 These orange mushroom pimples deform the mushroom’s gills and prevent the host mushroom from producing spores. The inside is white. Over a period of a couple of days, the fungus transforms the shape of the host mushroom, twisting it into odd shapes. 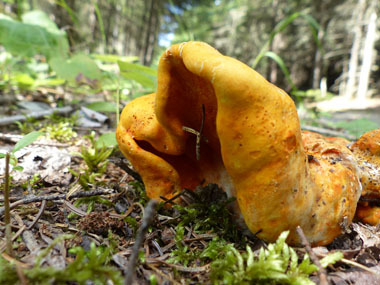 Height: The size of the lobster mushroom varies, depending on the size of the host mushroom. On average they are about15 - 20cm (6 - 8”) tall. Habitat: Lobsters are found throughout North America and they tend to like old-growth forests best. Season: Late July to October. Gills: The gills are transformed to blunt, chanterelle-like ridges. Edibility: Russula brevipes and Lactarius piperatus are the host mushrooms in which Hypomyces lactifluorum is created rendering this edible. Be sure you have properly identified this mushroom before picking. Be sure the inside “meat” is white and always cook thoroughly before consuming.